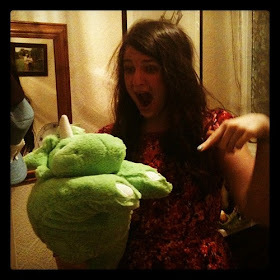 t*rexes and tiaras: my heart is on my sleeve.. 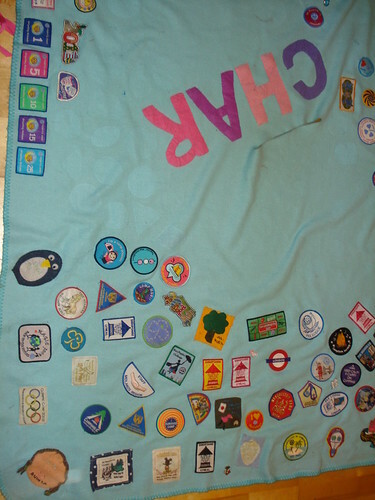 I must have mentioned it on Twitter before I went to Guide Camp, when I was having a rather speedy stitching session to try and get all of my badges back onto my camp blanket. 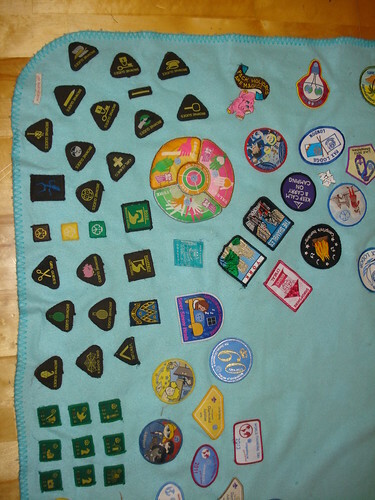 I think badge collecting may be one of my favourite traditions of Girlguiding. 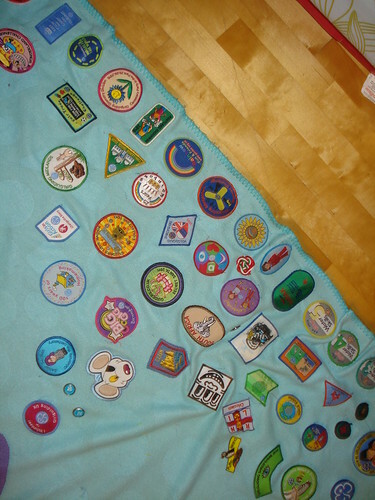 I've been adding all of the badges I've earned over the years to my camp blanket since I first went on a guide camp, which I think was when I was 13. I guess that's not that long, really. But I seem to have spent an awful lot of time sewing on, changing my mind and removing them to sew them on again in another position. 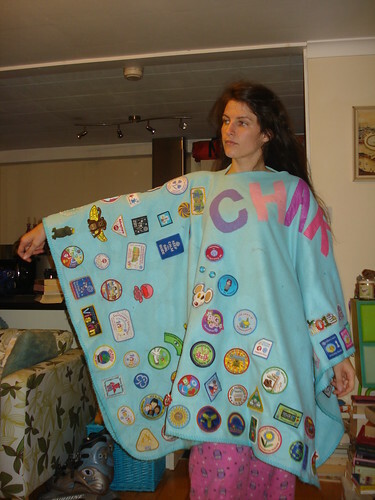 By my second or third guide camp, I decided it would be much easier to make my blanket wearable, and took a pair of scissors to it. I've still not got around to learning blanket stitch so that I can finish off the neckline neatly, but it's a fleece blanket so thankfully hasn't needed it. 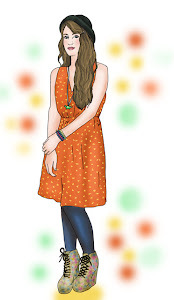 I have recently had *another* change-around of the layout, which I think I might be finally happy with. I'd been running out of space on the outside of the blanket, so what I decided to do was move anything which came from an event I'd not actually attended. It's nice when you meet people at guiding events (particularly the larger scale camps) and it's quite traditional to swap spares with others, which means that it doesn't take long to build up quite the collection. That means that on the outside, when I wear it, there are all of my own badges, from being a Brownie, Guide and a Ranger, from various camps and trips I've been on at one side, and all of the various challenge badges I do with the guides and the rangers in their meetings now, and those which I did with my Rainbow unit when I ran that a few years ago. I'm not sure what I'll do when I run out of blanket space altogether, which may not take long at this rate. 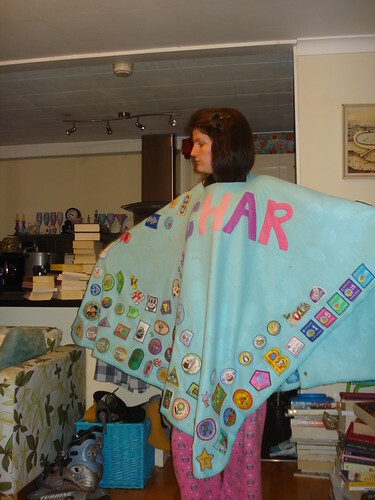 Your blanket is brilliant and I love that you can wear it too, very sensible!